In a recent series of essays, Bernie Lewin has shed considerable light on the early days of the Intergovernmental Panel on Climate Change (IPCC). Lewin’s guest post has generated an interesting discussion, in which both Tol and Meyer are actively participating. Moreover, behind the very push to re-constitute Working Group III for the 2nd Assessment – so as to cover the economic and social dimensions of the problem – was an attempt to incorporate the broader sustainable development goals of the 1992 Rio Earth Summit into the IPCC assessment processes. The tensions that developed in this Working Group, and which erupted in this controversy, can only be understood by recognising that this was always more than about the climate. Just as with the Toronto climate conference of 1988, here we find another bold attempt to channel the aspirations of the sustainable development movement towards realisation in policies driven by climate fear. If nothing else, the United Nations has proven to be very adept at engineering “mechanisms” (to use one of the UNEP’s favourite words!) which employ the concept of “lets you and him fight”. If you think about it, has there ever in the history of the UN been a more divisive issue than the purported perils of human-generated carbon dioxide – and its “contribution” to variously-called global warming, climate change and (the latest and greatest scare) “extreme weather events”? 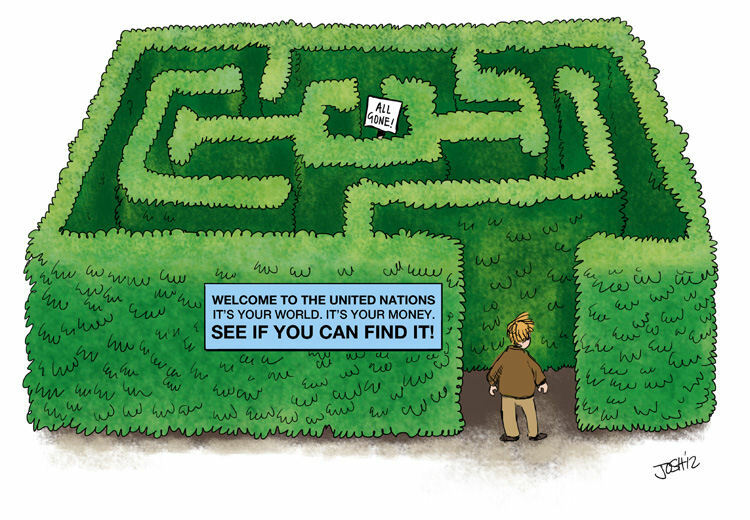 Towards this end, the UN’s army of unaccountable (and about as far from transparent as one can possibly get) bureaucrats invariably appear to have an uncanny knack of producing seemingly innocuous – but lengthy and sleep-inducing – documents. Thereby virtually guaranteeing that few – if any – of those who approve/accept/adopt them, will ever read in their entirety, that in which is planted the seeds of future disagreements. The “executive summary” (of sorts) of such documents is usually contained in a UN General Assembly (UNGA) “Resolution” percolated and filtered via the maze, so that the abbreviated and oh-so-innocuous wording (unanimously adopted “by all the nations of the world” of course) does not tell the full story. Truth be told, it doesn’t even tell half an eighth of the story! The UNEP and its “flagship” Agenda 21/Sustainable Development (not to mention its ever-increasing stable of acronymic offspring) are a case in point. The Quadrennial Comprehensive Policy Review of United Nations operational activities for development, and implementation of the outcome document of the Rio+20 United Nations Conference on Sustainable Development, were among the most prominent concerns today as the Second Committee (Economic and Financial) recommended its draft resolutions for adoption by the General Assembly. With the bulk of draft resolutions falling under the sustainable development cluster, many were linked closely to the Rio+20 outcome document, “The future we want”. In all, the Assembly adopted 17 texts on sustainable development, including a draft decision. Another draft stressed the importance of the continued substantive consideration of disaster risk reduction, and encouraged Member States and relevant United Nations bodies to take into consideration the important role of disaster risk reduction activities for sustainable development. Two related texts stressed international cooperation to reduce the impact of the El Niño phenomenon and to protect the global climate for present and future generations. By a text on implementation of Agenda 21, the Assembly stressed the need to develop the post-2015 development agenda. Also under the sustainable development umbrella were two annual texts stressing, respectively, the need for continued substantive consideration of the promotion of new and renewable sources of energy, and of biological diversity. Other sustainable development texts concerned the International Day of Forests and the Tree; Implementation of the International Year of Water Cooperation, 2013; Harmony with nature; Convention on Biological Diversity; and the report of the Governing Council of the United Nations Environment Programme (UNEP) on its twelfth special session. Taking up globalization and interdependence, the Assembly adopted two texts by recorded votes. The first, titled “Towards a New International Economic Order”, reaffirmed the need to continue working to integrate the principles of equity, sovereign equality, interdependence, common interest, cooperation and solidarity among all States into global economics. It then adopted, without a vote, the draft titled “Harmony with nature”, which called for holistic and integrated approaches to sustainable development that would guide humanity to live with nature, leading to efforts to restore the health and integrity of the earth’s ecosystems. Oh, and in case you’re interested one of the two “plenary-generated draft resolutions” was billed as “Promoting New Global Human Order“. For the record, it was adopted “without a vote”. The “details” evidently can be found in “document A/67/L.49” – for which, unfortunately there was no hyperlink. So who knows where one might find ’em. YMMV, however, I cannot say that I’m particularly thrilled about the thought of a “New International Economic Order”, a “New Global Human Order” – or of being “guide[d]” by an unseen text which (presumably) urges “Harmony with Nature”. But the bottom line is that no one would have a clue from any of the above “resolutions” that the United Nations has just given its blessing to “strengthening and upgrading” the UNEP. There are, however, indications that the actual outcomes from Rio+20 last June have been transmogrified into far more than could possibly have met the eye at the time. This, of course, conveniently paved the way for UNEP head honcho, Achim Steiner (and his “team”) to re-write history in a way that is more to his liking (and that of his Big Green “partners” drawn from “civil society”). I haven’t done so yet, but it will be interesting to compare Steiner’s “Policy Statement” – delivered at the “historic” opening of “the first universal session of the Governing Council of UNEP” in Nairobi, on Feb. 18 – with the IISD’s summary of these “historic” proceedings, which I had reported on previously (here and here). 44 sustainable/sustainability. Quelle surprise, eh?! 7 climate change – a “sub-programme” which “aims to strengthen the ability of countries, particularly developing nations, to integrate climate change responses into national development processes. Alas, it seems that “climate change” might be losing its status as the “greatest threat to the future of the planet”. The challenge of achieving not just incremental progress but transformative changes that can deliver absolute reductions in CO2, a halt to the loss of biodiversity, or a reversal of land degradation and the loss of arable land represents an unprecedented challenge – both to environment ministries and societies in general. phase-in more energy efficient bulbs. of over USD 110 billion. equivalent to the emissions of more than 122 million mid-size cars. In respect to cutting-edge science, UNEP’s third Emission Gap Report has become a key reference for governments negotiating towards a new agreement by 2015 at the Doha UN climate meeting. delay, emissions could rise to 58 gigatonnes (Gt) by 2020 far above the level scientists say is in line with a likely chance of keeping global temperature rise below 2 degrees Celsius this century. countries — estimates that there are potentially large emissions reductions possible in a mid-range of 17 Gt of CO2 equivalents from sectors such as buildings, power generation and transport that can more than bridge the gap by 2020. What’s this I do not see before me?! Look ma, no “carbon credit” mentions! But … Whoah! … Wait a minute! Is the UNEP’s “Emission Gap Report” – along with the “environmental governance” sub-programme’s “Fifth Global Environmental Assessment (GEO-5)” – stealing the thunder of the – conspicuously unmentioned – “gold standard” IPCC?! Hmmm … talk about “transformative changes”, eh?! It’s official: We have the right to question science! Costa Rica, home of UNFCCC exec sev’y C Figueres, is a Caribbean State. ?! Surprise?! If you think about it, has there ever in the history of the UN been a more divisive issue than the purported perils of human-generated carbon dioxide. But with that pretty much dead as a practical issue, and the Communist bloc disintegrated, the luvvies needed something else to protest about. The more practical ones went for hunger. But there’s precious little political mileage in that, so the more political ones have fallen on CO2.